“Alarm system” is an umbrella term that encompasses any device designed to detect and signal either an intrusion or a hazardous condition. These devices include, but are not limited to: burglar alarms, carbon monoxide detectors, door alarms, fire alarms, flood detectors, security systems, and smoke alarms. All states have a strong and established interest in protecting the safety and welfare of its citizens. Due to this interest, states regulate alarm system companies with licensing rules. Alarm system companies are not always required to obtain a license. For example, companies operating in Colorado or Wisconsin do not currently need to get a license. However, these two states represent the exception rather than the rule as most states do have a license requirement. Typically, a company can obtain an alarm system service license by filling out their state’s license application and paying the required license fee. Additional requirements, which vary from state to state, include: having an employee pass a required exam, designating a qualified agent, providing a certificate of insurance, providing a description of the training that the company will provide to their employees, listing all locations of branch offices, submitting a criminal background check record for each employee, and submitting fingerprints. In some states, alarm system companies will have to obtain separate alarm licenses – one license for a burglar alarm and another license for a fire alarm. For example, South Carolina separates the burglar alarm system business from the fire alarm system business. Similarly, in Utah, you can only obtain a burglar alarm license. To be in the fire alarm systems business, a company would have to successfully complete the Fire Alarm Inspecting and Testing Certification Program. In some states, alarm system companies will have to obtain either a contractor’s or electrical contractor’s license. A contractor is an individual or business entity who is contracted to do work and supervises construction. In contrast, an electrical contractor performs specialized construction. An electrical contractor helps to design, install, maintain, and service electrical systems. Other states require a low voltage contractor’s license. For example, an alarm company who is contracted to install, maintain, repair, or service low voltage systems in Arkansas and Georgia would be required to obtain this type of license. Alarm systems are increasingly becoming an important and, arguably, a necessary component of any business or residential security plan. 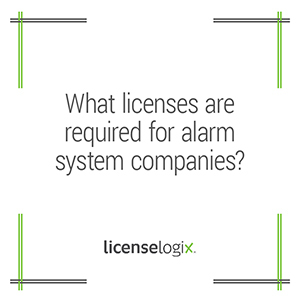 LicenseLogix will help you navigate through the complex and often confusing world of alarm company licensing .We will identify and obtain all of the licenses that you need, saving you the time and hassle of having to do it yourself. Or, if you already have obtained licenses, we can manage license renewals and ongoing license compliance. To get started, click here or call us today at 800-292-0909.